(BACKGROUND) Recently, development of an endoscopic surgery in Japan is remarkable, but surgical complications by lack of technique and recognition for an endoscopic surgery has become a social problem. Since a professional education / training for the purpose of medical safe standard improvement is very important, we regularly perform the seminar that is specialized in a fundamental manual skill for young surgeons, at our training center for endoscopic surgery. 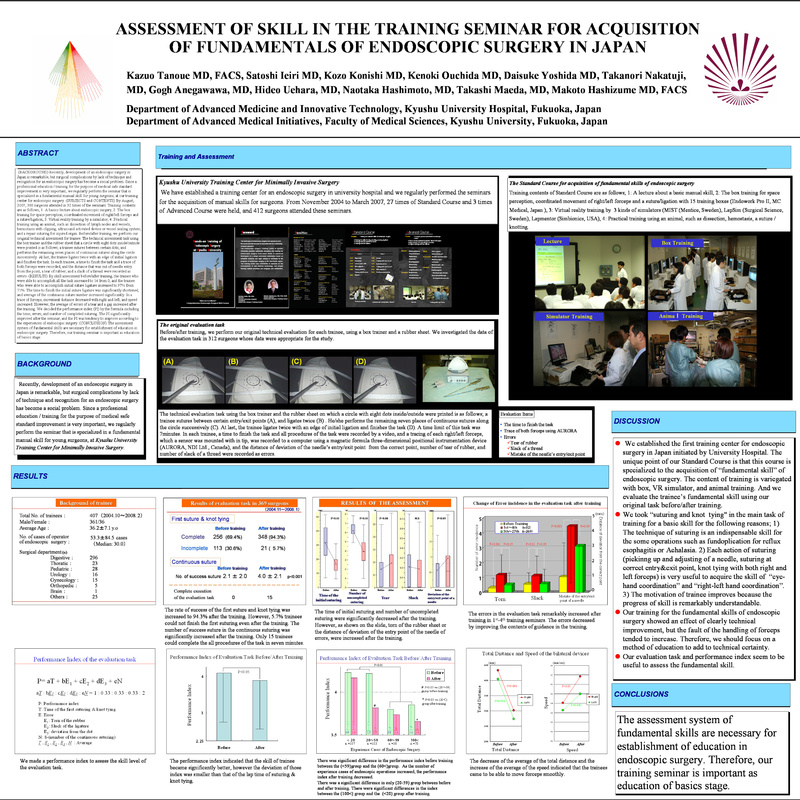 (SUBJECTS and CONTENTS) By August, 2007, 380 surgeons attended in 32 times of the seminars. Training contents are as follows; 1: A basics lecture about endoscopic surgery, 2: The box training for space perception, coordinated movement of right/left forceps and a suture/ligation, 3: Virtual reality training by a simulator, 4: Practical training using an animal, such as dissection of lymph nodes and vessels, hemostasis with clipping, ultrasound activated devise or vessel sealing system, and a repair suturing for injured organ. Before/after training, we perform our original technical assessment for trainee. The technical assessment task using the box trainer and the rubber sheet that a circle with eight dots inside/outside were printed is as follows; a trainee sutures between certain dots, and performs the remaining seven places of continuous sutures along the circle successively. At last, the trainee ligates twice with an edge of initial ligation and finishes the task. In each trainee, a time to finish the task and a trace of both forceps were recorded, and the distance that was out of needle entry from the point, a tear of rubber, and a slack of a thread were recorded as errors. (RESULTS) By skill assessment before/after training, the trainee who were able to accomplish all the task increased to 14 from 0, and the trainee who were able to accomplish initial suture ligature increased to 97% from 71%. The time to finish the initial suture ligature was significantly shortened, and average of the continuous suture number increased significantly. In a trace of forceps, movement distance decreased with right and left, and speed increased. However, the average of errors of a tear and a gap increased after the training. We decided the performance index (PI) by the formula including the time, errors, and number of completed suturing. The PI significantly improved after the seminar, and the PI was tendency to improve according to the experiences of endoscopic surgery. (CONCLUSION) The assessment system of fundamental skills are necessary for establishment of education in endoscopic surgery. Therefore, our training seminar is important as education of basics stage.